Mac - Made in USA - Coming in 2013! This is big news, and welcome news. It would appear that Apple has decided it is more cost effective, and makes business sense to move some production to USA factories. This is welcome, at a time when economic times are tough. I would be interested in a Mac assembled or made in USA! Right now some Macs are assembled in USA, look for one near you! Thinking about the new Challenger? Take a look at the quick comparison between the 3 major models available. The comparisons look at the 2009 model year. Listen to why America is the Greatest Country in the World, and why. Poor quality again for Apple. Seems paying exuberant prices doesn't always give you the best. Thats what happens when you think you know what is best, instead of using tried and true solutions. Apple should start making all those little chinese kids who make their products, work toward better quality goods. One of the best reasons to delay buying into cutting edge products. When Apple launched the new Macbook Pro Retina Display (rMBP), it set a new bar for monitor resolutions. Unfortunately, it doesn’t appear to have set it quite high enough — an increasing group of customers are loudly unhappy with unacceptable image retention times and what’s described as burn-in. Those terms imply three different types of display problem. Ghosting is a motion blur effect that occurs when pixel response time isn’t high enough, while burn-in refers to permanent screen damage caused by the long-term display of a static image. Neither term accurately describes what’s happening here. We need more real American's like Rep. Mike Kelly from PA. If only more of them would stand up to be heard, we could defeat the Socialists running things today very easily. In other words, for all intents and purposes, you cannot service or upgrade this MacBook Pro yourself. That alone is enough to relegate it to the “festering dung heap” corner of my conscious interest. Friends Don't Let Friends Vote OBAMA! Want to know why we are in debt? This guy says the truth. Great to have a smart conservative know what he is talking about. We won't be voting Obama, no matter what. If a brick runs, the brick gets my vote. It is about time that someone says this. I was thinking it myself. Leave it to one of my favorite web and magazine technology gurus... Point is that we are indeed becoming sheep. The article speaks of the latest Mac laptop, but this statement is far reaching, and transcend technology! Dvorak says: I write about this trend every so often and I find it very distressing because of the effect it has on the users of this equipment. It fosters a feeling of helplessness at all levels of daily life. No wonder there is a great and growing dependency on government and institutions; the public has been trained as a permanent dependent. Take a look at the article for yourself. Another brilliant piece... I wonder, with all the liberal hippie BS that flows from Apple (I use Mac software too) how is it they can justify toss away and wasteful products, such that use soldered and proprietary parts and drives, that can not be replaced in case of failure. Sorry, I won't be buying the new Macbook anytime soon. 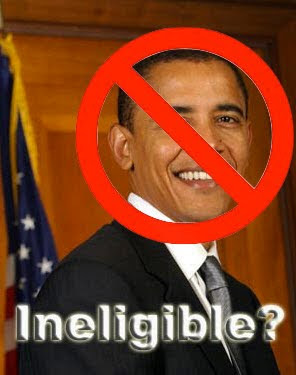 What if Obama was ineligible to run for President? As incredible as this seems, the DC elites may have turned a blind eye for nefarious reasons. You consider the transcript and facts while the site exists. This court case in Georgia could remove him from the ballot in that state! Well, the latter. And the question for me today is—I talk about this post-constitutional country we are in, and the name of the book is “Ameritopia,” because I believe we live today not in the American republic, you know, founded by our forefathers, we live in an “Ameritopia.” And I’ll give you some examples, as I do in one of the chapters, of the book. Look around in your house. You can’t even decide what light bulb to put in your house or showerhead or toilet. Open your medicine cabinet. Everything in there is regulated. Look at your electronics. Every single electronic device you have has some government stamp of approval. Washing machines, dryers, toasters, the gypsum board that is used to build your home, the roofing tile that is on your house, whether you can actually build a house on a particular piece of property that you own, all of this is regulated and managed by government.